Oculus VR and co-founder Palmer Luckey are being sued by Zenimax Media and id Software, the former employer of Oculus VR Chief Technical Officer John Carmack. The suit claims that Luckey and Oculus VR, which worked with Carmack while he was still employed by id Software (owned by Zenimax Media), stole and misappropriated "trade secrets relating to virtual reality technology." The suit was filed in Texas (where id Software is located), and follows up on legal claims Zenimax was already making publicly. For its part, Oculus VR denied Zenimax's previous claims in a followup response, which stated, "There is not a line of Zenimax code or any of its technology in any Oculus products." Carmack openly worked with Luckey in the lead up to the Oculus Rift's tremendously successful Kickstarter campaign, and he eventually joined the company full-time last year. According to a statement issued by Zenimax, "All efforts by Zenimax to resolve this matter amicably have been unsuccessful." In more specific terms, the lawsuit claims that Luckey and Oculus used "trade secrets, copyrighted computer code, and technical know-how relating to virtual reality technology" after having signed contracts barring them from doing so. At least part of that is in reference to work Carmack did publicly, when he ported Doom 3 to the Rift and showed it to press at the game industry's annual E3 trade show. Carmack's stated publicly (to Wired most recently) that when he and Luckey worked together initially, there were, "no NDAs, no signing anything." The legal action is in direct response to the purchase of Oculus VR by Facebook recently for $2 billion. As the lawsuit states, "Defendants now stand to realize billions of dollars in value from Zenimax's intellectual property." It also says that, regardless of what Carmack was doing outside of work hours, "Carmack and other Zenimax employees conducted that research at Zenimax offices, on Zenimax computers, and using Zenimax resources." Moreover, it reveals for the first time the extent to which Zenimax was investing in VR behind-closed-doors at its Texas-based game studio, id Software. "For many years, ZeniMax invested tens of millions of dollars in research and development, including research into virtual reality and immersive technologies," the suit filing reads. 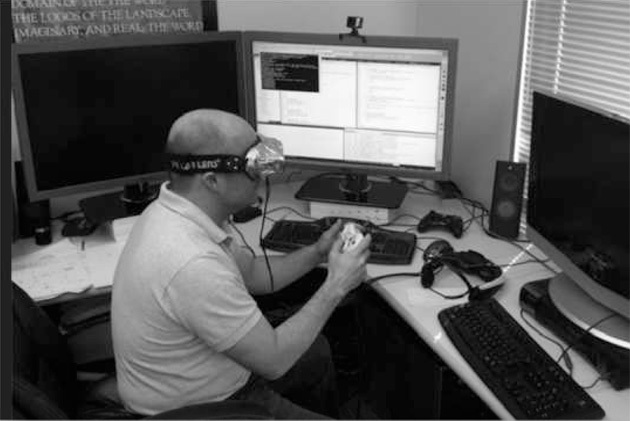 There's even an image included in the suit (seen above) with an id Software employee testing, "a virtual reality headset in Zenimax's offices using Zenimax's VR Technology." Following E3 2012 where the Rift was first shown to the press by Carmack (still employed by Zenimax at the time), Zenimax says "Oculus and Luckey lacked the necessary expertise and technical know-how to create a viable virtual reality headset." As such, Zenimax says that Luckey and Oculus "sought expertise and know-how from Zenimax." There's no specific number set for how much money Zenimax is asking, but the company is asking for a trial by jury. We reached out to Oculus VR for comment and have yet to hear back. "The lawsuit filed by ZeniMax has no merit whatsoever. As we have previously said, ZeniMax did not contribute to any Oculus technology. Oculus will defend these claims vigorously."